QVC finally got around to issuing a press release on its collaboration with NBC’s morning “Today” show,” as both entities search across the country for new products for the home shopping network. The hunt started in August, and this week nine budding entrepreneurs will showcase their innovative inventions on “Today’s Next Big Thing” a collaboration between QVC TODAY to discover the next big product to be sold on QVC. As part of the initiative, inventors were asked to submit their creative ideas. From those submissions, nine finalists were chosen across three different categories including: apparel and accessories; home, households and pets; and kitchen and gadgets. Starting today, Tuesday, the products in each category will be pitched live on “Today” to a panel of judges that includes Doug Howe, QVC’s Executive Vice President of Merchandising, Jill Martin, “Today” contributor and Creative Director of QVC’s G.I.L.I. fashion and accessories line and Al Roker, “Today” anchor. Viewers can vote on their favorite product each day, beginning Tuesday, today, by going to Today.com. This Friday, the inventors of the product receiving the most votes in each category will have one last chance to win over the judges and explain why their product deserves to join the ranks of QVC’s best-selling items. The overall winner selected by the judges will sell their product live on QVC this Saturday 3 at 10 a.m.
“The joy of discovery and the power of storytelling is a big part of who we are and what we do at QVC,” Howe said. Here’s the boilerplate on QVC’s involvement with entrepreneurs. Over the past 29 years, QVC has launched and fostered the growth of some of today’s most successful brands. TODAY’s Next Big Thing aligns with QVC’s commitment to find new products and inspiration for customers, and supports QVC Sprouts, which is QVC’s ongoing crowd-sourced product search. They seek the best up-and-coming products from inventors and entrepreneurs, giving those with a retail-ready product the opportunity to be sold on QVC.com and the chance to grow their businesses through a scalable and nurturing process. Tune in to Saturday Morning Gifts on Saturday, October 3 at 10 AM (ET) for a firsthand look as the TODAY’S Next Big Thing top contender showcases their winning product. Visit QVC.com to purchase the products of all nine finalists. To learn more about QVC Sprouts, visit http://www.QVCSprouts.com. Evine Live got some plugs Monday night on primetime network shows that feature two of their vendors — Paula Deen and Heather Dubrow. We’re talking about ABC’s “Dancing with the Stars,” which featured scenes from Deen’s kitchen shows this past weekend on the home shopping network, while Bravo’s “The Real Housewives of Orange County” showed a peek at Dubrow and her doctor-husband Terry’s launch of their skincare line Consult Beaute in April. “Tonight continues Evine Live’s transformation with our multi-platform ‘Brands with Fans’ strategy,” Evine Live CEO Mark Bozek said in a canned statement. “Viewers of both ‘Dancing with the Stars’ and ‘The Real Housewives of Orange County’ will get a behind-the-scenes look at Evine Live,” he said. Monday’s ‘Dancing’ episode featured footage of Paula’s Evine Live food show, “Paula Deen’s Kitchen,” as well as her and Louie’s dance rehearsals at the retailer’s studio. Throughout season 10 of “The Real Housewives of Orange County,” the Dubrows have adventure launching their skincare line, which has taken more than 15 years to develop. Monday’s episode of “The Real Housewives of Orange County” showed viewers a behind-the-scenes look at the live launch of Consult Beaute on Evine Live on April 18. 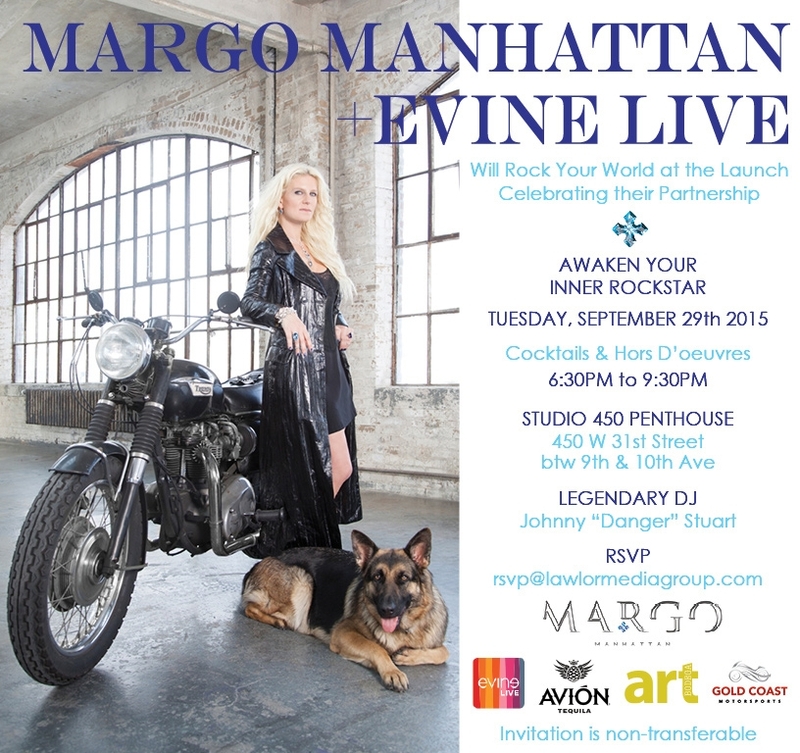 Last month Evine Live announced a bunch of vendors who were coming to the network this fall, including jewelry designer Margo Manhattan. We didn’t know who she was, but we do now. We looked her up because lo and behold, Evine Live invited us to a launch party this Tuesday for her jewelry line. That shindig will be held at Studio 450 Penthouse in Manhattan, of course. So what’s the deal with Ms. Manhattan? She makes jewelry for celebs such as Selena Gomez, and Beyonce wore one of her necklaces for her “Blow” video. The pieces are chunky sterling silver and gold, and remind us of the late Scott Kay’s work. In fact, we have a large Scott Kay silver cross that looks very much like the one Beyonce had on. Super star Bey is wearing Manhattan’s necklace in a scene where she’s decked out in a colorful bustier. We can’t wait to see what her Evine Live pieces look like. We hope that they are not so scaled down that they lose the appeal of Manhattan’s more upscale jewelry. Manhattan made headlines in New York City a few years back when her shop on tony Madison Avenue was robbed. In fact, the necklace that Beyonce wore was reportedly one of the items taken. We liked the fact that Manhattan said she wasn’t worried the lose of $54,000 in merchandise, she was just happy that her saleswoman was unharmed by the thief. Is HSN Selling Fords At A Discount On Oct. 3? Do you want to buy your Ford on HSN? It looks like you might be getting the opportunity on Oct. 3. HSN.com then links to the auto maker’s dealer locator. That’s all we know, and thanks for the tip, Michael! We are probably the only people that over-pay our taxes, because we don’t want to get in trouble. So it always amazes us when knuckleheads get involved in scams and never seem to expect to get caught. Maybe they figure if Bernie Madoff got away with robbing people for years, they can pull it off. 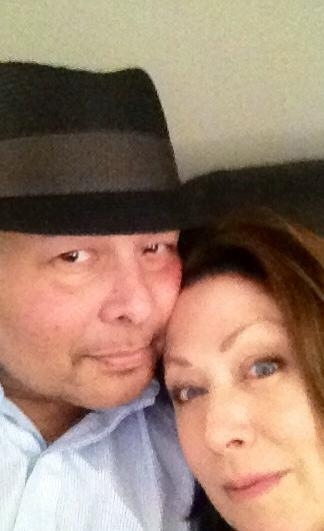 Yet Douglas Rae, a former QVC employee, allegedly defrauded the home shopping network of millions of dollars by submitting phony invoices. Here is the press release from the U.S. Attorney in Pennsylvania. PHILADELPHIA – Douglas S. Rae, 58, of Bethlehem, PA, was charged today by indictment with participating in several schemes to defraud his former employer, a company based in West Chester, PA, of millions of dollars. Rae is charged with seven counts of mail fraud, 25 counts of wire fraud and conspiracy to commit wire fraud, and three counts of money laundering, announced United States Attorney Zane David Memeger. In related matters, also charged today by information were John R. Hodde, 53, of Aubrey, TX, and Michael H. Keppler, 55, of Ridgewood, NJ. Hodde and Keppler are separately charged with two counts of wire fraud and conspiracy to commit wire fraud for their alleged participation, along with Rae, in schemes to defraud Rae’s former employer. According to the indictment, between 2006 and 2013, Rae devised a scheme to defraud his employer by submitting invoices from two companies he controlled for goods and services that were never delivered. Rae controlled the bank accounts for the two companies, Lighting Equipment Sales and Service, Inc. (“LESS”), and Lighting Products International, Inc. (“LPI”). He caused the victim company to pay over $900,000 for bogus LESS and LPI invoices, and he took the proceeds for his own personal use. The charging documents further allege that from 2007 through 2013, Rae and Hodde devised a scheme to defraud Rae’s employer by submitting bogus invoices from Hodde’s employer, Barbizon Capitol, Inc. (“Barbizon”). One of the ways the men allegedly carried out this scheme began with Hodde allowing Rae to use Hodde’s corporate credit card account, which Rae used to for personal expenditures such as home appliances, airline tickets for him and his wife to visit their vacation home, personal electronics, and dental services. It is further alleged that Rae and Hodde then worked together to create bogus invoices from Barbizon to Rae’s employer for purported product sales, when in fact Barbizon did not supply any of the product. Rae and Hodde created the bogus invoices in amounts to reimburse Barbizon for all of Rae’s personal expenditures on the Barbizon credit card account, plus an approximately 10% mark-up, which Barbizon kept. In this manner, Rae and Hodde allegedly caused the victim company to pay over $560,000 for bogus invoices submitted to it from Barbizon. The other way Rae and Hodde allegedly carried out their scheme involved Rae submitting bogus invoices from LESS and LPI to Barbizon, and then at Rae’s direction, Hodde allegedly generated corresponding bogus invoices from Barbizon to Rae’s employer, along with an approximate 10% mark-up for Barbizon to keep. Neither LESS, LPI, nor Barbizon supplied any of the product for which the victim company was invoiced. In this manner, according to the charging documents, Rae and Hodde caused the victim company to pay over $200,000 for the bogus invoices. Barbizon retained approximately 10% of those proceeds, and the remainder were forwarded to LESS and LPI and deposited into bank accounts controlled by Rae. Between 2010 and 2012, Rae and Keppler allegedly devised a scheme to defraud Rae’s employer by submitting bogus invoices from Keppler’s company, Keppler Engineers, LLC (“Keppler Engineers”). Rae directed Keppler to generate invoices from Keppler Engineers to Rae’s employer that contained particular item descriptions, descriptions of services, and specific prices, and Keppler did as directed. Rae and Keppler caused those invoices to be submitted to the victim company for payment. The victim company paid Keppler Engineers for the invoices, and then Keppler Engineers paid all but approximately 10% of the proceeds to LPI, which Rae deposited into bank accounts he controlled. Neither Keppler Engineers nor LPI provided the products or services to the victim company. According to the charging documents, Rae and Keppler caused the victim company to pay over $170,000 for the bogus invoices from Keppler Engineers. Rae is further charged with conducting three separate financial transactions of over $10,000 each in criminally derived proceeds. If convicted, Rae faces up to 20 years in prison on each count of mail fraud, wire fraud, and conspiracy to commit wire fraud, and up to ten years in prison on each count of money laundering. He also faces up to three years of supervised release, full restitution, a fine, a $3,500 special assessment, and criminal forfeiture. Hodde and Keppler each face up to 20 years in prison on each count of wire fraud and conspiracy to commit wire fraud, full restitution, three years of supervised release, a $500,000 fine, and a $200 special assessment. The case was investigated by the Federal Bureau of Investigation and is being prosecuted by Assistant United States Attorney Nancy E. Potts. Home shopping networks can’t get enough of the ladies from Bravo’s various “Real Housewives” franchises. Confidential, the gossip column in the New York Daily News, on Thursday reported that the Countess LuAnn de Lesseps of “The Real Housewives of New York” will be launching a jewelry collection on Evine Live on Oct. 15. De Lesseps already does an apparel line for Evine Live. The countess joins Lisa Vanderpump of “The Real Housewives of Beverly Hills” in terms of selling jewelry on Evine Live. De Lesseps was apparently in a watering hole in Manhattan sucking down one of our favorite cocktails, a dirty martini, to celebrate the news of her first jewelry collection. HSN’s philanthropic arm is partnering with Lucasfilm to support UNICEF by broadcasting a “Star Wars” edition of “The Monday Night Show with Adam Freeman” this Monday. During the two-hour primetime special Ashley Eckstein, the voice of “Star Wars” character Ahsoka Tano and founder of the Her Universe sci-fi merchandise brand for female fans, will present exclusive items of “Star Wars” apparel to raise funds for the U.S. Fund for UNICEF. Eckstein will appear on-air alongside HSN Inc. CEO Mindy Grossman and Caryl M. Stern, the President and CEO of the U.S. Fund for UNICEF. During the event HSN will donate 20 percent of the purchase price for every item featured and sold during the special to the U.S. Fund for UNICEF. In addition to apparel, the selection of “Star Wars” products will include items like a Star Wars Walkie Talkie, Stormtrooper watch and Darth Vader cuff links. HSNi Cares has started a campaign that runs through Sept. 30 across television, catalogs, digital and social channels, raising funds and awareness in support of UNICEF. All eight HSNi brands – HSN, Frontgate, Grandin Road, Ballard Designs, Garnet Hill, TravelSmith, Improvements and Chasing Fireflies – have come together to fulfill HSNi Cares goal of empowering women and supporting families in times of need globally, through interactive digital activations and customer donations across their channels. Dang, we can’t keep up with all this home shopping news! 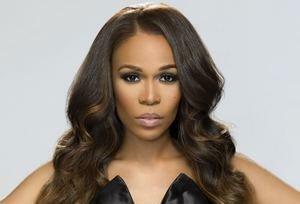 Evine Live just announced that Michelle Williams, formerly of Destiny’s Child, will preview her “Believe at Home” line on the network on Sept. 23. Williams — a Grammy winner, singer, songwriter and actress — will give fans a sneak peek at her collection of home products, with the full line debuting this spring. Evine Live went with the hype, calling Destiny’s Child “the biggest pop group of all time.” We don’t know about that. “Michelle’s broad reach in the Pop, Gospel and R&B worlds coupled with her approachability and sophisticated sense of style make her a perfect addition to the Evine Live family and further expands our assortment of ‘brand with fans,'” Russell Nuce, the network’s chief strategy officer, said in a canned statement. “I’m so excited to come to Evine Live and share my passion for design with viewers,” Williams said in her canned statement. Inspired by her grandmother and mother who made beautiful hand-made items for their family, and her world travels as an actress and musician, the line is a timeless and unique collection of home products that embody Michelle’s style and passion for design. During the September 23 preview, Michelle will feature several items, including a duvet set and embroidered sheet set. The full collection will be revealed during the official premiere, planned for Spring 2016. Michelle first rose to fame as a member of the internationally acclaimed female pop group Destiny’s Child. She has sold 150 million records and received more than 150 awards, including three Grammy awards, Billboard Music Awards, MOJO and many other accolades. In addition, Michelle is also an accomplished solo music artist, topping the Billboard Top Gospel Albums chart and Billboard Hot Dance chart. She released her first album in over five years, Journey to Freedom, which showcased the singer’s natural talent and versatility. She has also captivated audiences on theatrical stages and in television, appearing in the hit Broadway musicals “Aida,” “The Color Purple” and “Chicago.” Michelle is represented by Holly Carter, President of Relevé Entertainment. You are currently browsing the Homeshoppingista's Blog By Linda Moss blog archives for September, 2015.